Hanukkah on Thanksgiving? I know, a little bit of a different title. I will explain but you will have to indulge me in some “factoid” information. A rare occurrence is happening this Thanksgiving. The second day of Hanukkah is on Thanksgiving for the first time in 125 years and it will be another roughly 77,800 years before this happens again. I love history and learning about different holidays. So, when I found out that little tidbit of Hanukkah and Thanksgiving there was no way I was going to let this great opportunity pass without some sort of acknowledgement. I am not Jewish and the most I knew about Hanukkah was from watching “Fiddler on the Roof“. So, I did a little research and this what I discovered in a nutshell. About 160 years before the birth of Christ, King Antiochus IV destroyed the temple and was set on destroying the Jewish race. A small band of Jewish soldiers fought the king’s army and against all odds defeated it. The Jews reclaimed the temple. The temple was in shambles. So, the people restored the temple. When they went to light the menorah, there was only enough pure oil to burn for one day. However, according to Jewish tradition, the oil miraculously burned for 8 days. This was long enough for more oil to be prepared. Hanukkah is a celebration of the rededication of the temple and God’s protection of His people. Hanukkah is sometimes called “The Festival of Lights” or “The Feast of Dedication” (see John 10:22 above). My hubs and I wanted to use this unique holiday combination to remind our children how God takes care of His children. So, we are going to give them a little taste of Hanukkah starting on Thanksgiving Day and carry it over to the next day. Here is what you are going to need. 1. 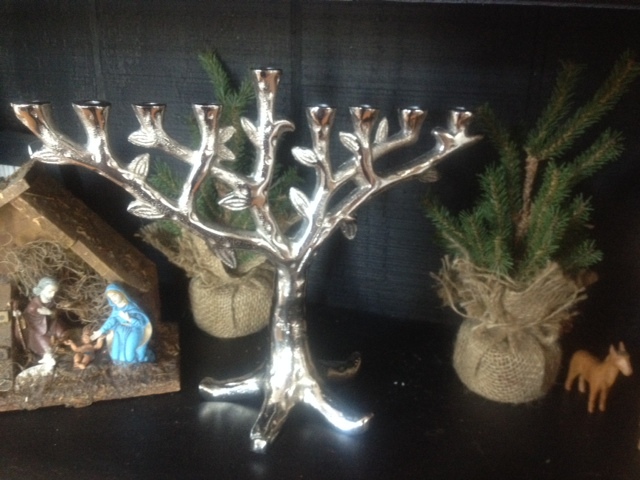 A Menorah (or you could use 9 candlesticks lined up in a row). The Menorah – There are 9 branches to the menorah. The tallest branch is the servant candle. This candle will light all the others. The number of candles lit coincides with the day of Hanukkah. Day 1 you light one candle, day 2 two candles, etc. The candles are lit alternating right and left side and are lit 30 minutes after nightfall. A blessing is then said. 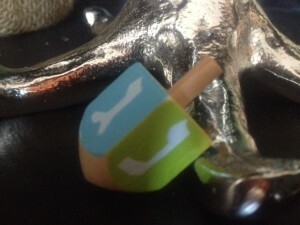 Dreidel – The Dreidel is a 4 sided top that is used in a children’s game. This is done to remember the children who were forced to study the Torah “underground” during the time of Antiochus IV rule. The children would study the Torah in the forest and when soldiers would come upon them, they would hide the Torah and pull out their dreidel’s and start playing. The best way to see how to play the Dreidel is to google it on the website. 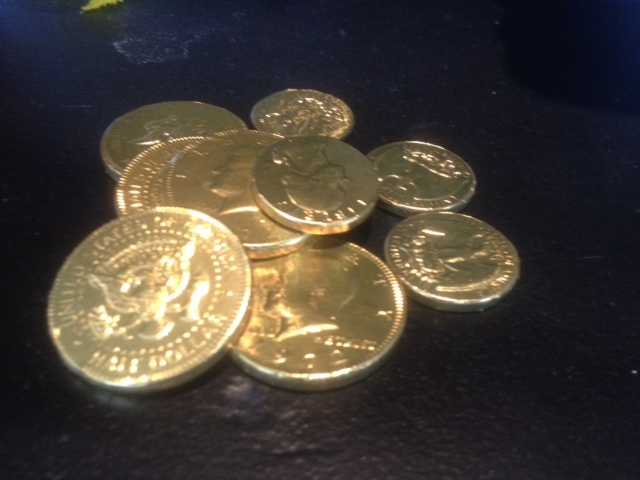 You will need the Hanukkah gelt which is the chocolate gold coins for this game. Latkes – Latkes are basically potato pancakes fried in oil and served with applesauce. Once again, there are a gazillion recipes on how to make Latkes for Hannukah. Just google “Latkes” and you will have your fair share of choice recipes. Sufganiyot (Doughnuts) – Now who does not like a good doughnut? These are made for a dessert one night cooked in oil. All the foods are cooked oil to remember how God provided the 8 days of oil for the menorah. How are we going to incorporate Hanukkah? Thanksgiving Day – We will light the first candle of Hanukkah, read The Story of Hanukkah to the children, and explain how God provides and protects His children. Then we are going to go around the table and ask each member to tell a way that God has shown His provision and protection to us this past year. Friday – Doughnuts for breakfast. I am going to attempt to make them with the kiddos help. Dinner will consist of fish and latkes. During the day, I will show the kids how to play Dreidel and we will play a few rounds. We will continue lighting the candles each night until all are lit. This will then carry into our family tradition of lighting the advent candles. There is so much more to Hanukkah. What I have shared with you is just the scratching of the surface. 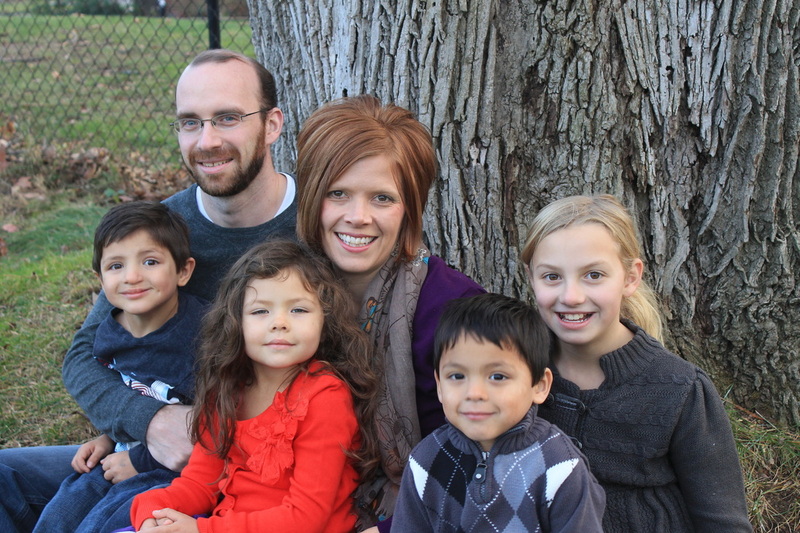 Thanksgiving is a time to thank God for His goodness to us. His protection of the Jewish race brought us a Savior and His continue protection of the Jewish race will one day usher in our King.